The Amazon may attract more fame and glory, but the Pantanal is a better place to see wildlife. In the Amazon, the animals hide in the dense foliage, but in the open spaces of the Pantanal, wildlife is visible to the most casual observer. If you like to see animals in their natural environment, the Pantanal – with the greatest concentration of fauna in the New World – should not be missed. Located in the center of South America, the world’s largest contiguous wetland is 20 times the size of the famed Everglades in Florida – some 210,000 sq km. Something less than 100,000 sq km of this is in Bolivia and Paraguay; the rest is in Brazil, split between the states of Mato Grosso and Mato Grosso do Sul. 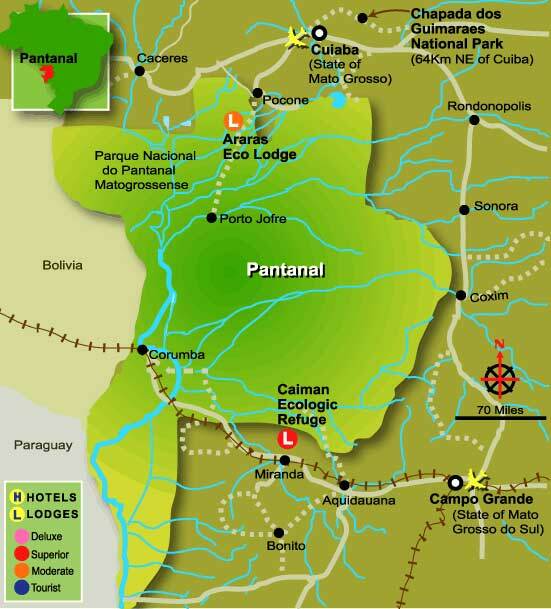 The Pantanal has few people and no towns. Distances are so great and ground transport so poor that people get around in small airplanes and motorboats; 4WD travel is restricted by the seasons. The only road that runs deep into the Pantanal is the Transpantaneira. This raised dirt road sectioned by around 125 small wooden bridges ends 145km south of Poconé, at Porto Jofre. Two-thirds of the intended route from Poconé to Corumbá (at the border with Bolivia) has been left incomplete for lack of funds and particularly for ecological concerns. The Parque Nacional do Pantanal Matogrossense occupies 1350 sq km in the southwest of Mato Grosso, but most of the Pantanal is privately owned. The national park and three smaller private nature reserves nearby were given Unesco World Heritage listing in 2000.